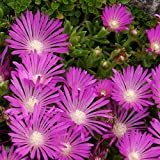 Delosperma cooperi growing subshrub succulent of the genus Delosperma also known as Trailing Iceplant, Delosperma cooperi perennial evergreen used as ornamental ground cover plant, can grow in mediterranean, desert, subtropics or temperate climate and growing in hardiness zone 5-11. Leaves color green or red in cold weather in linear shape, the leaf is fleshy. 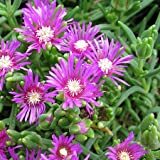 Flower color purple in multi petals. 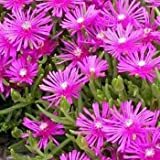 Delosperma cooperi PURPLE ICE PLANT Hardy Exotic SEEDS!